katiemaytoo quilts: september UFO done! I know it's early in the month, but I'm going to show it off anyways! You'd think I live in "The Windy City" - Chicago - but I don't. I guess I just have bad timing for photography? But this isn't all I finished on Saturday! 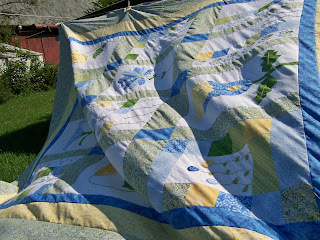 That green really made this quilt green. Yikes! But it's not a bad thing. This is for my sister-in-law's second baby, due by c-section the day after Thanksgiving. (That's November 25th for those of you who don't live in the US.) Plenty of time to get it quilted (once I figure out what to do), but you all know I'll be sewing the binding down Thanksgiving morning! I'm really pleased with how this came out. You may remember the original, shown in my post here (scroll down a bit). How very different with brighter colors! And then I made dinner. :) Feta and Bacon Stuffed Chicken with Onion Mashed Potatoes but I don't recommend the potatoes. They were a bit bland and dry. Sunday afternoon = more football, so back up the sewing room. I'd found my cutting table (it was somewhere under all the baby quilt fabric!) and clearned some space on the ironing board from the UFO blocks, so I allowed myself to start something new. Something with a deadline! Remember I talked about the head scratching and hair pulling to figure out how much extra fabric to buy? Turns out I didn't need it. ARGH! But that means I have extra in case I make any mistakes (cutting these was not as easy as you might first think) or for throw pillows if I don't! It took a few deep breaths to cut into this fabric, though. Three flowers are needed for each block and each of these three is a different size. Lots to keep track of, but I think it's all good. I haven't started sewing anything yet, but I hope to soon. And the pink fabric was for pillowcases, but I'm going to try to get this quilt done (top at least) first and see if I have enough left over to use for cuffs on the pillowcases. 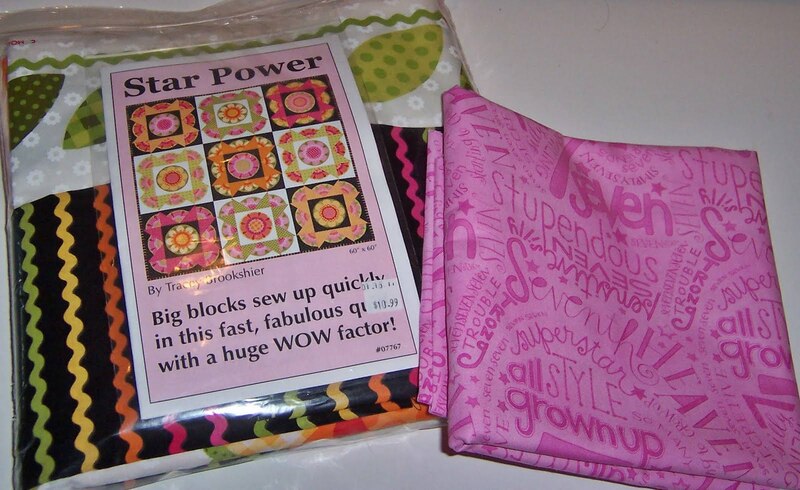 The pillowcases will be for my niece's birthday (in November), but how cool would it be that a month later she gets a quilt that matches for Christmas?! I hope it works out. I just hope I can make myself part with this when it's done because it's really cute! So that's mostly what I've been up to. PS I nearly forgot to add this! 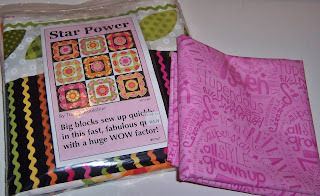 Your quilts are just wonderful!!! I dont know if I'd be able to give up that quilt! I am sure your neice will love it! You are constantly amazing and inspiring me. I can't wait to haul out my machine again! 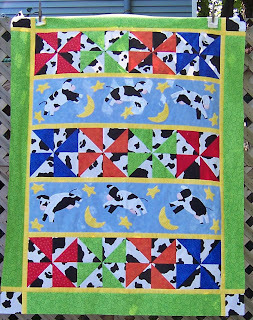 I like that green on the cow quilt! I also like that mentality of facilitating easier storage. ;D And YAY you passed with tons of room to spare! Everything is gorgeous! The quilt top is very pretty and the embroidery dresses it up. Some beads would really make it sparkle. Hope you find a reason to finish it, I think it will be a great quilt. The cows are adorable and I like the bright colors. Your niece's quilt will be beautiful. She is a lucky little girl. We knew you would do well on your test, yay! Well....all cows must have green grass, right? 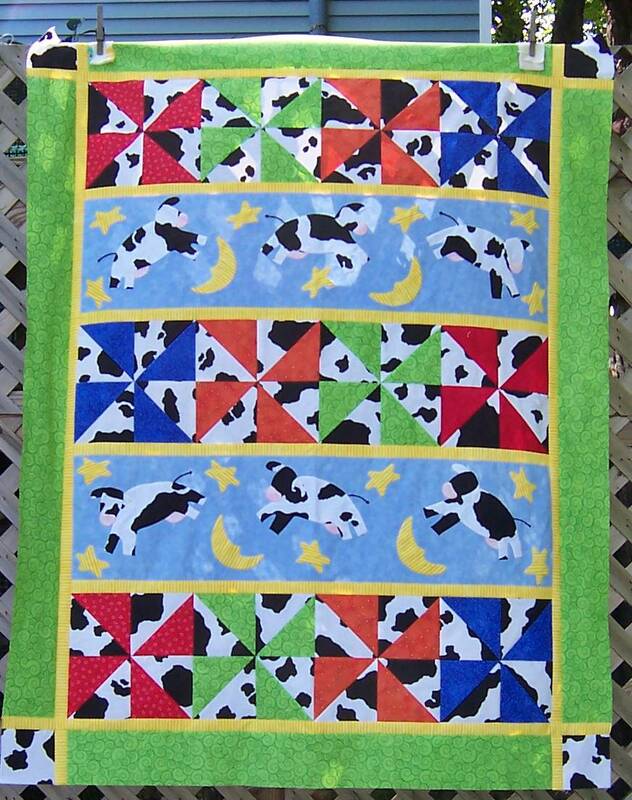 I think the green is perfect, and the quilt is cute as can be! All the other projects look/sound great too! Best of all for this blog is that test grade! That surely must have you at the top of the class! ---"Love"
More fantastic finishes. The one with the embroidery is really soft and pretty. The embroidery looks good. I wouldn't add beads until after quilting it either. The cows...those cows are soooo much cuter than the book colors. I have that book and while I love the cows, my brain wasn't seeing past the colors. Duhhh. Thanks for the inspiration. I had NO doubt that you would pass with lots of room to spare. Congrats again. Continued good luch on the job hunt. 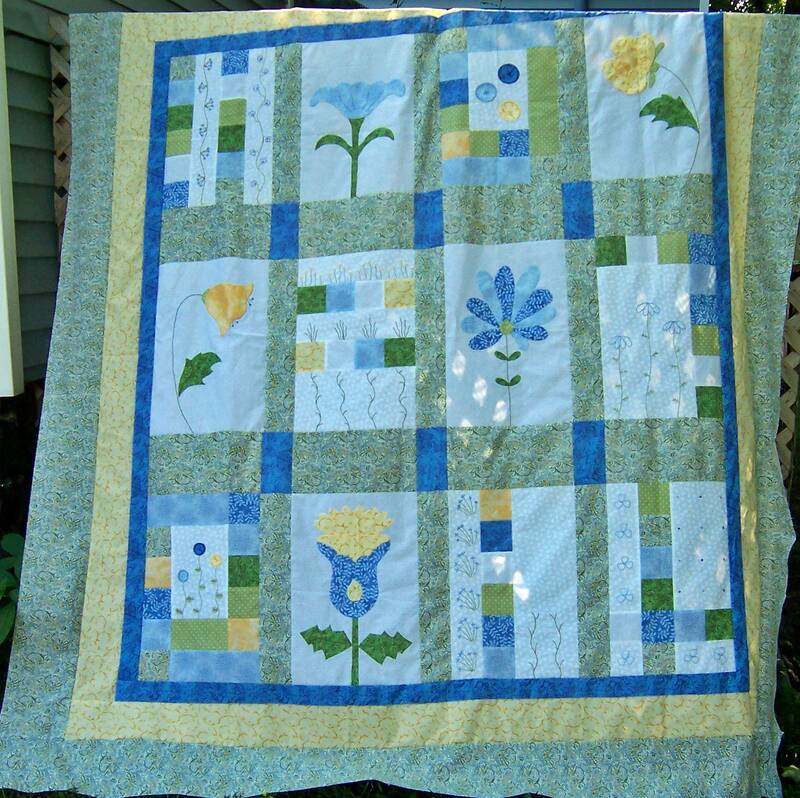 Love the applique quilt! Those colors would have caught my eye, too! Cows are adorable. Just trying to figure out what you will be doing with the wedges. Love the pinks! Congrats on everything--you've accomplished a lot! (you're right about tops storing better--I never had that problem before I started finishing things!) Love the colors of your fruit slices--yummy! 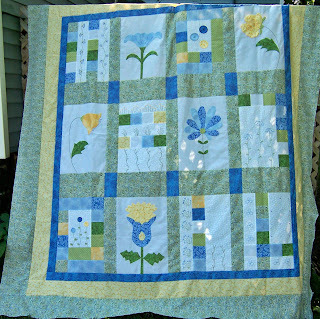 I love the flower UFO...especially the button flowers in the lower left block!